It's hard to relax under a wobbly ceiling fan. If yours no longer rotates as it should, take these steps toward making the repair. 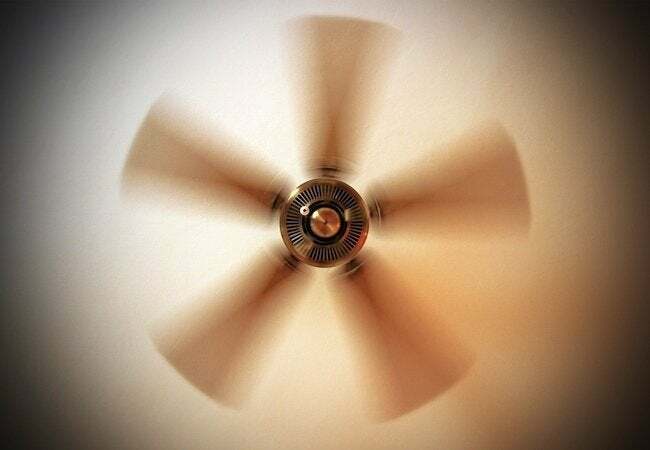 Ceiling fans are great—until they get wobbly. What causes that to happen, and how can you go about fixing a wobbly ceiling fan? First, check for dirt on the blades. Yes, even a small buildup can cause wobble. Use a sponge and household cleaner to get off the grime. Wobbling could also mean one or more of the blades has become warped or cracked. Replace if necessary. If the blades look okay, check to see if they’re out of alignment. You can do that by using a yardstick to measure from the upper tip of each blade to the ceiling. If the distance varies, check for loose screws where the blades are attached to their metal housings. Also, those housings sometimes get slightly bent—from overzealous cleaning or whatever—and need to be gently bent back to their original position. If none of that works, head to the home center and pick up a blade balancing kit. They’re only a few bucks, and if they help you solve the problem, there’s no doubt you’ll consider that money well spent.